The office hours for Delta Counseling Associates, Inc. are from 8:00 A.M. to 5:00 P.M., Monday through Friday. Our offices are closed on Saturday and Sunday and on the following holidays: New Year’s Day; Martin Luther King’s Birthday; President’s Day; Memorial Day; Independence Day; Labor Day; Thanksgiving Day and the day after; and the day before Christmas and Christmas Day. Advance appointments, except in the cases of emergency, must be made in order to make sufficient time available for the therapeutic session for each client as well as to efficiently use your time and the therapist’s time. To make an appointment, you may walk into or call the service center nearest you between 8:00 A.M. and 5:00 P.M., Monday through Friday. We will attempt to make every effort to arrange the appointment to accommodate your schedule. Your therapist will likely indicate the need for a return visit when you see him or her. If your therapist dos recommend that you return, please make arrangements for this before you leave by stopping by the receptionist’s window. If you find that you will be unable to keep your scheduled appointment, please notify the receptionist as far in advance as possible. This will permit us to assign that time to another client who wishes to be seen. Each time that you arrive for an appointment with your therapist, we ask that you register with the receptionist. During this registration, please inform us of any changes in your name, address, telephone number, insurance coverage, or other important information so that we can contact you when necessary and prepare the correct insurance claim forms for you. The federal law referred to as HIPAA requires such disclosure. You should also be aware that laws and regulations do not allow for the protection of the confidentiality of any information about suspected abuse or neglect nor for any confessions you may make about having participated in any such abuse from being reported under Arkansas state law to the appropriate authorities. Client complaints are never ignored at our company. We want you to know that at any time during your treatment, you can register a complaint or grievance about any treatment-related problem you may be experiencing. To lodge such a complaint, call the Monticello Service Center at 1-(800) 323-2703 and ask the receptionist to connect you with the company’s Client Advocate. Once connected, tell the Client Advocate you name, your address, the name of the service center at which you are receiving services, and then briefly describe the nature of your complaint to the Client Advocate. The Client Advocate will promptly review the merits of your grievance, will render impartial consideration, and will work diligently to arrive at an equitable resolution to the problem as quickly as possible. You should be aware that grievable matters are those complaints regarding treatment-related problems, dissatisfaction, or protested action of your mental health treatment. Non-grievable matters are those complaints regarding conditions which are beyond the control of our company, or matters set by law, or matters governed by regulations , or matters governed by executive order, or matters approved and documented in the company’s policies and procedures. Our company is required to charge fees for the mental health services that we deliver. 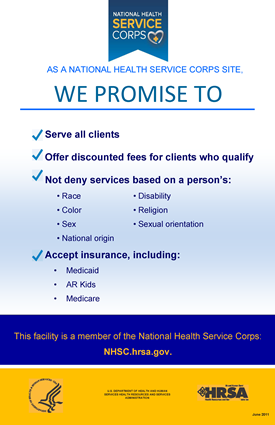 Often, the cost of these services can be covered by private or group insurance or by other “third party” reimbursement sources. Our company does accept assignment of insurance benefits for most major insurance programs, including Medicare and Medicaid. Clients are expected to pay their portion of those fees that are not covered by insurance, (e.g., deductibles and co-payments, etc.). Although every effort will be made to arrive at and collect a reasonable fee for the services we provide, no one will ever be denied needed services because of a legitimate inability to pay for them. Accredited by the Joint Commission on Accreditation of Healthcare Organizations since 1998. Delta Counseling Associates, has been helping the communities in Southern Arkanasas for over 40 years.